Comments: Celebrate the rise of the Star Wars Mpire with a great new series of whimsical M&M's plush figures based on characters from the entire Star Wars saga. 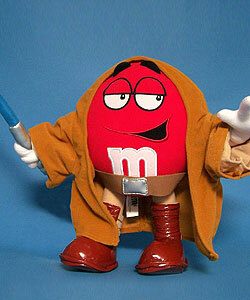 M&M Obi-Wan exhibits the calm and cool character befitting a true master--perhaps that cool is what's keeping the lightsaber from melting his hand? Destined to be classics, get these while you can! Star Wars Mpire Obi-Wan 12" plush doll was available through a promotion at Stop & Shop and Giant grocery stores from May 1 through May 14, 2005.